After conflict broke out in December 2013, we lost track of Angelina Juang and her colleagues who were collecting plastic bottles dumped on the streets of Juba. The NGO Juba Recycles, which used to buy the plastic bottles from them, shut down its activity in the weeks that followed the start of fighting. Months into the South Sudan civil war, in 2014, we learned that the women collecting plastic bottles had also stopped their work. But that was all we knew, until possibility arose recently to try and find out what had happened to Angelina for the past five years. Was she still in Juba? Angelina had come to the capital from the eastern town of Pibor, after communal fighting occurred in that region in 2011. She was displaced and had no choice but to join her oldest daughter in Juba. In order to contribute to the house’s expenses, she needed to find something to do. 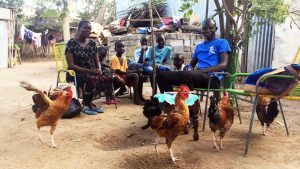 That’s how she joined other women in a peculiar activity: inspecting every street corner, every garbage heap, to dig plastic bottles out, collect and sell them to Juba Recycles, at a low price – hundreds of bottles were required to earn just $1. But it was the only job she could find, to earn a little something. Moses Obale, who used to work with Juba Recycles back in 2013, was willing to try and organise a visit to Angelina’s daughter’s house, five years after we had filmed there. He himself did not quite remember the house’s exact location in Munuki district. He knocked a few doors before arriving at the right place to inform Angelina, her daughter – or whoever was still living there – that we wanted to meet. A man he didn’t know was in the house. He told Moses that Angelina had passed away. It was only a few days later that Moses found out it was a misunderstanding. She was still alive. But she wasn’t in Juba anymore. Angelina’s daughter, Andera Joseph, at home with her children and Moses Obale in September 2018. And on a Sunday evening, we went back together. We knocked at the door, unchanged since 2013 – a red iron sheet between two pieces of bamboo fence. Angelina’s daughter, Andera Joseph, let us in. We sat with her and her five children under small mango trees, and found out that Angelina had gone back to Pibor in December 2015. “She is doing fine” Andera told us, and explained that the whole family decided it was better for her to go back to Pibor, the village where she was born. After the job of plastic collection stopped, with no income, she had become a burden for the family, already struggling to make ends meet and pay the children’s school fees. “Surviving in Juba is really hard” said one of Angelina’s grand-sons, maybe 12 years old, his little brothers and sisters squeezed around him, quietly listening to the conversation. I asked if she was working, now that she had returned to Pibor. Andera looked up and smiled: “Is there work anywhere?” she said, ironically, as if it was obvious that there was no job awaiting Angelina, back in Pibor. “She just stays at home, the home of relatives” Andera added. We talked about their life in Khartoum – where Andera was born in the 1980s – until the death of Angelina’s husband, her father, who was a soldier in the Sudanese army. They came back to South Sudan afterwards, in 2002. Life in Pibor was hard compared to what it was in Khartoum. Andera left to Juba after getting married, and Angelina joined her only years later, to flee a local conflict, in 2011. In 2015, it is conflict once again – the current civil war in South Sudan – that pushed her to return to Pibor. As we were about to leave the house, Andera said that Angelina had been inquiring about us – us who had come to film her five years ago, and did not get in touch afterwards. “Did these people come back?” she had been asking her daughter. It was a visit long overdue. Watch Story of Mary: Part 8 here.